Hi Guys! I’m enjoying my last few days in the city and have been gobbling and drinking my way through New York at a fairly disturbing rate thank you very much. I feel like I have honed over eating to an art form in the last week. Oink oink. But I have also come across lots of amazing dishes that I can’t wait to recreate for you once I am back in my own kitchen! Oh yes, and drinks too! I had an amazing classic French 75 the other night and it reminded me that I should share this cocktail with you asap. 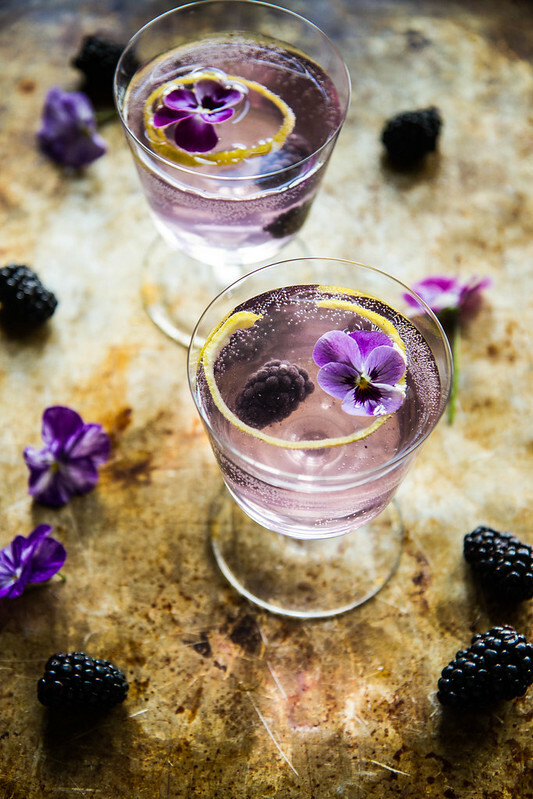 This blackberry French 75 has all of the charm and elegance of the original but with the added flavor and color of blackberry. It’s totally lovely and perfect for Summer entertaining. Enjoy! In a small pan, add the water, sugar and blackberries. Simmer for 5 minutes, stirring and then strain into a heat proof container like a mason jar. Set aside until cool and then chill in the refrigerator until ready to use. 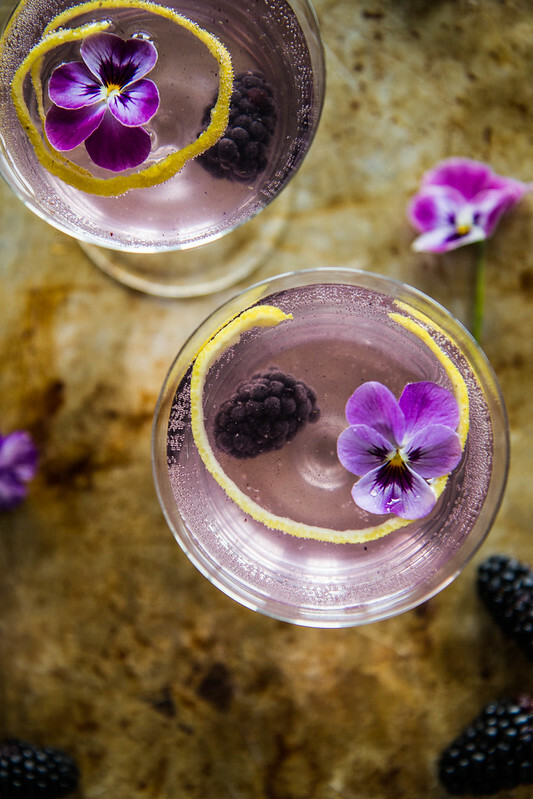 Fill a cocktail shaker with ice and add 2 tablespoons of the blackberry simple syrup, 1 ounce gin, 1 tablespoon fresh lemon juice and then shake vigorously. Strain into a cocktail glass and then top with about 2 ounces of champagne. Garnish with a lemon rind and fresh blackberry if desired. Those little flowers make this so pretty!! Love it! This cocktail is gorgeous! Always love the classics! So gorgeous! I love this. Simply gorgeous! Love the shots! 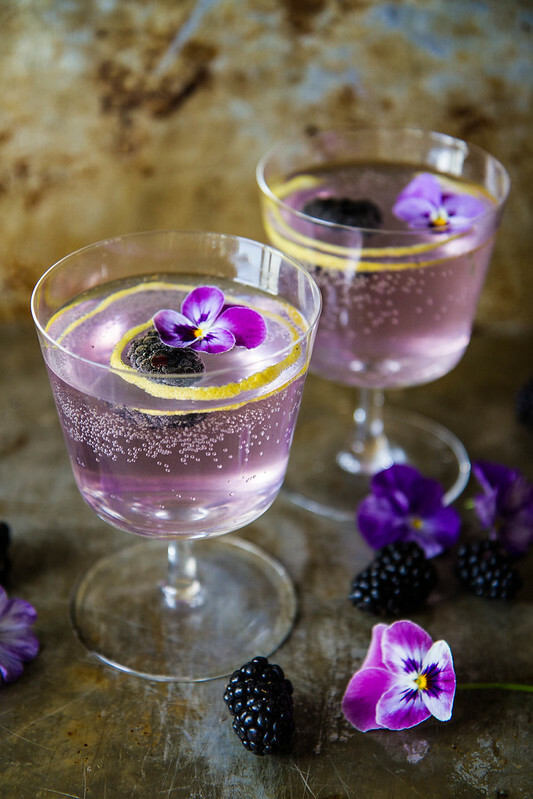 Could you substitute vodka I don’t like gin but this looks lovely & I want to make it for summer parties. Darlene- of course! deep down I prefer vodka over gin as well and this would be awesome with vodka. Beautiful drink!! Eating your way through a city is the only way!! Pingback: Vegetarian, Gluten-Free Roundup: Cookie Dough Frosting on Cookies? Such a fun twist on the classic! People living with you are so lucky, I hope they do enjoy your taste, & that you deserve gratitude. Thank you for such delightful pics.